The shifting cultivation stabilization policy after the mid-1990s in northern Laos had a fundamental impact on rural lives, including an accelerated migration of non-Lao ethnic people. Based on household-level detailed data collected in 2010–11 from eight villages in Luang Prabang Province, we analyze first the differential impacts of such a policy on different types of villages in terms of location (access to urban centers), land endowments, ethnic composition, etc. Then we examine the role and limitations of village-level savings groups (SGs) introduced by an NGO (supported by the Lao Women’s Union) from the middle of the first decade of the twenty-first century. It is found that most of the SGs faced difficulties in accumulating savings, which resulted in a shortage of funds that could be credited to needy members. Money borrowed from SGs is used mainly for medical treatment and consumption. It is suggested that income stabilization and diversification is one of the key factors that facilitate villagers’ participation in SGs. In the late 1990s, village savings and credit groups (hereafter savings groups, or SGs) were introduced from Northeast Thailand to Laos by NGOs—Foundation for Integrated Agricultural and Environmental Management and Community Organizations Development Institute of Thailand—with the cooperation of the Lao Women’s Union (LWU), first to villages in Vientiane Municipality and later to hinterland areas where the market economy was less developed (see Ohno and Fujita, special issue introduction paper). Raiffeisen’s credit unions in Germany formed the original model for credit unions later developed in other areas, including other European nations, the United States, Japan, and also Northeast Thailand. When credit unions were introduced to these other areas, the economy—even in rural areas—was already commercialized and had a favorable infrastructure, which resulted in the successful growth of credit unions. In contrast, such conditions do not exist in Laos. The rural economy of Laos is still basically subsistenceoriented and largely isolated from urban centers due to poor infrastructure. Under such a “forced commercialization” of livelihood in a short period of time, a critical question is: how did people adapt to the new policy and institutional environment in general, and how could they earn sufficient cash income to purchase rice and other necessities in particular, since it appears to have been difficult to produce enough rice only in the allocated upland fields? Migration, especially among non-Lao ethnic people who had hitherto lived in mountainous highland areas, began toward lowland areas, including Vientiane and other cities. The movement seemed to occur voluntarily (if not always willingly) but was often accelerated by government policy, including the LUP/LA program, because non-Lao people lost their major means of livelihood in their original areas. Many lowland Lao villages accepted such migrants. After the middle of the first decade of the twenty-first century, almost at the same time as the introduction of the LA program, savings groups were introduced in some villages in Luang Prabang Province. Their effect seems to have been rather limited, especially compared to the impact of the shifting cultivation stabilization policy, but neverthe less rural livelihoods were affected to a certain degree. The major purpose of this paper is to assess the impact of the SGs on rural finance and livelihoods in mountainous Laos, where the market economy is less—or least—developed and the effect of the shifting cultivation stabilization policy is substantial. Conclusions are based on an analysis of household-level data collected by the authors in 2010–11 from several selected villages in Luang Prabang Province. Not much research on rural finance has been carried out in Laos. The study by UNDP and UNCDF (1997) is an important and comprehensive one on rural savings and finance. The researchers covered nearly 3,000 rural households from 129 villages all over the country. Especially notable points in connection with our study are that (1) they collected data on non-financial savings such as livestock and precious metals, along with financial savings such as cash and bank deposits; and (2) they dealt with “village revolving funds” (VRFs) such as rice banks and livestock banks, along with a list of major NGOs that initiated VRFs. They indicated that in the mid-1990s there were about 1,650 VRFs, of which more than 1,000 were rice banks. NERI (2003) issued a report on VRFs, based on a questionnaire survey to 142 district government offices such as LWU, Lao Youth Union, Agriculture Office, Planning Office, Social Welfare and Labour Office, Finance Office, and Agricultural Promotion Bank (APB) branch (by special arrangement with the post office). The number of villages with VRF activities reached 2,452, of which the APB branch accounted for 1,231 (50.2%), followed by LWU (642; 26.2%). But in terms of the number of beneficiaries and the amount of savings, LWU was the most important, accounting for 31% and 40% of the total, respectively. The importance of LWU in monitoring VRFs is notable. It is reported that there were 1,203 rice banks, of which 366 (30.4%) were monitored by LWU, and 420 livestock banks, of which 124 (29.5%) were monitored by LWU ( ibid. , 14–15). NERI and Concern Worldwide Lao PDR (2005) conducted an in-depth study on expenditure patterns and saving habits of ethnic minorities in Laos. Twelve villages from six provinces—Hauphanh, Luang Prabang, Khanmmoune, Savannakhet, Saravan, and Attapeu—were selected, and a total of 117 households were surveyed. Focus group discussions were also carried out. Notable findings in connection with our study include the following: (1) there was major spending in health care and education, with an average of 12.8% of total expenditure going to health care and 5.6% to education (2005, 21); and (2) 40.1% of households had no savings, and the major savings of the remaining 60% households were in the form of livestock (49.3%), stored grain (23.1%), cash (22.4%), precious metals (2.6%), and so on. Most of the studies mentioned above were conducted before the shifting cultivation stabilization policy started to have a strong impact in rural areas. Our study conducted during 2010–11 can shed light on this recent important issue, because the LA policy was introduced to our study villages during 1993–2005. The other major difference of our study is that it focuses on SGs transplanted from Northeast Thailand, which are quite different from traditional VRFs in that financial savings, not non-financial savings (such as rice and livestock), are regularly collected from members and loaned back to needy members. Monetary transactions are much more complicated, and training of some women villagers is indispensable. In this sense, the SG is more “formal” in nature at the village level compared to traditional VRFs. In section 2 of this paper we analyze household-level data to show the basic economic structure in the study villages, including population characteristics, landholding and cultivation, rice production and consumption, occupations and income-earning structure, and major non-land asset distribution. The effect of the government’s shifting cultivation stabilization policy on rural economy and livelihood is one of the focuses. In section 3 we discuss the role and limitations of SGs in the study villages, with special reference to coping strategies for health and other risks people face. We selected eight villages in Luang Prabang Province for this study. Two of them are located in suburban Luang Prabang, while the remaining six are along the valley of the Ou River in Ngoy District, spread between the towns of Nong Khiaw and Muang Ngoy (Fig. 1). NH1. Another connecting road between SKA and NH1 was completed in 2010,7) which improved the communication system for SKA.8) However, as vehicles are unable to use these unpaved roads during the rainy season, boat transportation is still important. The other villages (SKO, HH, and HC) depend solely on boat transportation for communicating with the outer world. In sum, the rural infrastructure, especially road networks, is much better for XL, KN, and SH than for the remaining five villages. Except for XL and KN,9) we conducted a census household survey.10) The average number of house-hold members and labor force per household for 490 households were 5.27 and 2.57, respectively. Source: Prepared by authors based on household survey in 2010–11. 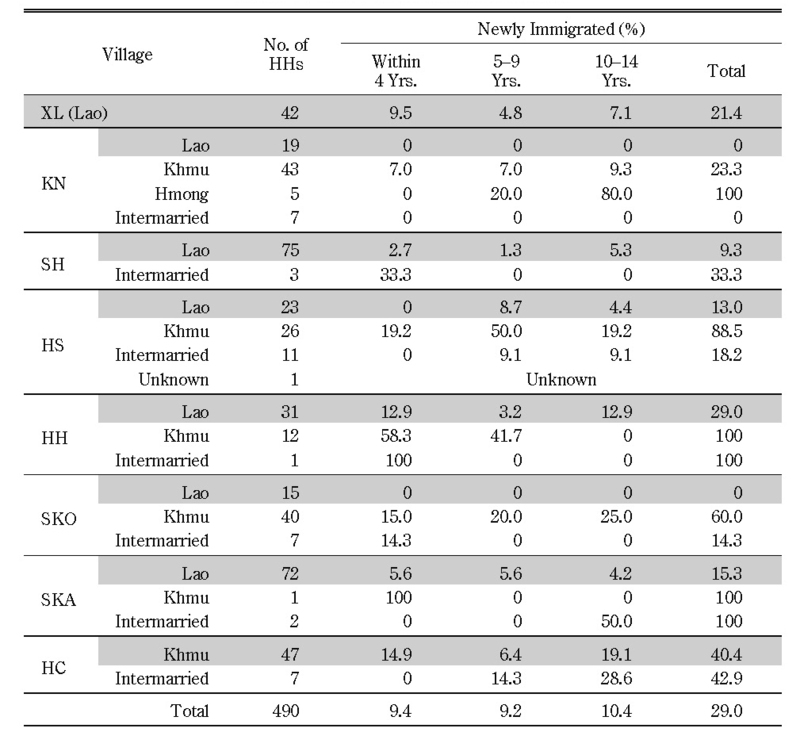 The people in the study villages consisted mainly of three ethnic groups: Lao, Khmu, and Hmong.11) As Table 2 demonstrates, XL, SH, and SKA are nearly pure Lao villages and HC is a nearly pure Khmu village. The remaining villages are multiethnic. Table 2 also shows the percentage of households recently (within 15 years before our survey in 2010–11) immigrated into each village. Most of the multiethnic villages expanded recently due to the immigration of Khmu and Hmong to Lao-dominated villages. KN is an exception as the village was formed relatively long ago. Note that HC (a Khmu village) also accepted many Khmu immigrants in recent years. In the early 1990s the Lao government initiated a program for shifting cultivation stabilization, as mentioned earlier. Table 3 summarizes the progress of the land allocation program in the study villages. The program was started in the mid-1990s, beginning in villages with a favorable infrastructure and followed by remote villages several years later. The program was not implemented in XL village, as this village was relocated to the bank of the Mekong River from a more favorable lowland area soon after 1975 by the Revolutionary government as penalty for taking sides with the ousted regime. Our survey reveals that in most cases three plots of land were allocated to each household, with the size of a plot varying from 0.5 to 1.5 ha, depending on land endowments in each village.12) The LA program induced villagers to reduce or stop shifting cultivation. In HS, for instance, before 2005 (when the program was introduced in the village) villagers had 7 to 10 plots of land per household, which enabled them to secure a sufficient fallow period and an upland rice yield of more than two tons/ha. However, after the program the fallow period was sharply shortened and the rice yield dropped to less than one ton/ha. We surveyed the status of shifting cultivation for each household. On average, 36.2% of households never practiced shifting cultivation, 25.8% used to practice it but stopped, and 37% were still practicing it.13) Households still practicing shifting cultivation are generally found more in Ngoy District villages (except SH and SKA). There is a notable difference between ethnic groups. Among the Lao 52.7% never practiced and 28.9% have stopped (with only 18.4% still practicing); 62.1% of the Khmu are still practicing and 27.2% have stopped (with only 10.7% never having practiced); and 80% of the Hmong are still practicing and 20% have stopped. According to the local land categorization, there are mainly three types of land: lowland ( naa), upland ( hai), and garden ( suan). Lowland has been reclaimed by individual households14) and is not allocated under the LA program. It is managed by individual households for growing lowland rice. Table 4 shows the landholding status of households for lowland, upland, and garden land. Land under fallow when we conducted our survey was often not reported by the respondents and thereby not recorded in the table. Several important findings can be drawn from the table. First, there is a large disparity among villages in terms of endowment of lowland, although the average area per owner household is almost identical—0.9–1.1 ha. The percentage of lowland owner households is highest in SKA (89.3%), followed by SKO (75.8%), SH (65.4%), HH (50%), HS (44.3%), and KN (33.8%).15) In the case of HC the percentage is almost nil (3.7%). 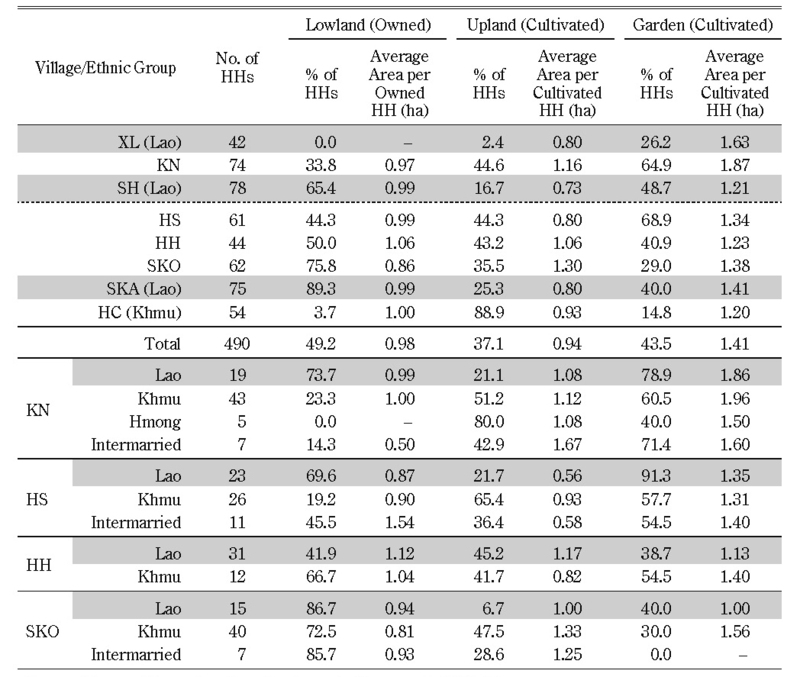 The low percentages in HS, KN, and HC seem to reflect the composition of ethnicity, because the Khmu and Hmong have traditionally not engaged in lowland paddy cultivation. However, it should also be noted that the percentage is quite high among the Khmu in SKO and HH. The generally assumed relationship between ethnicity and choice of crop cultivation is not necessarily fixed. Note: Upland and garden in XL were not allocated through LA program. Average area is calculated for only landowning households. In the case of lowland, XL is excluded. Second, naturally, there is a tendency for villages with poorer lowland endowments (i.e., HC, KN, HS, and HH) to depend more on the other types of land. In upland fields, many people still grow (upland) rice. Since each household is allocated three plots of land, the villagers usually follow a system in which a two-year fallow period is incorporated—such as rice-fallow-fallow. Since they apply no chemical fertilizers to upland field (with a few exceptions), at least a two-year fallow period is indispensable. In the case of HC, since a household is allocated only two plots, the people have to rent-in another plot in order to follow the two-year fallow system. In fact, our survey in 2011 revealed that 15 households rented-in a plot from SKA village and paid 150,000–200,000 kip per household as land rent. On the other hand, people usually grow cash crops in their garden. With the exception of KN,16) when people introduce cash crops such as vegetables and tree crops such as teak and fruit, they re-categorize the upland as garden. In this sense, the percentage of households with garden can be a good proxy indicating the extent of agricultural commercialization. HS (68.9%) recorded the highest figure, followed by SH (48.7%), HH (40.9%), SKA (40%), SKO (29.0%), and HC (14.8%). Table 4 also shows that the Khmu attained lower figures in both reclamation of lowland paddy fields and introduction of cash crops to upland. The failure of HC in these two aspects represents a typical case of the Khmu people adjusting poorly to the new policy and institutional environment in northern Laos. 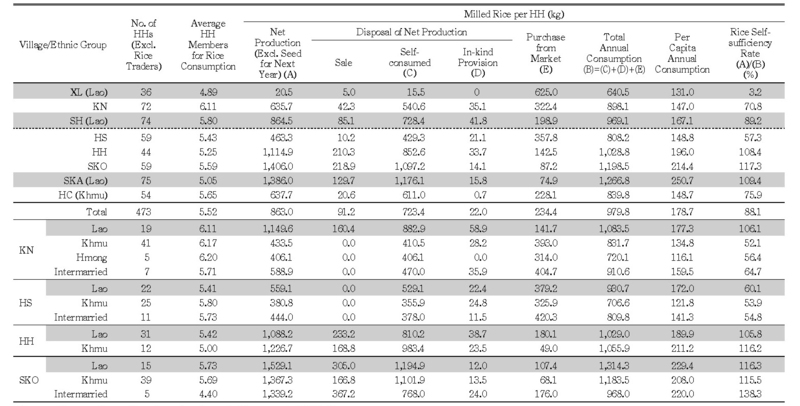 Table 5 summarizes the status of production and consumption of rice in each village. Regarding the per capita annual rice consumption, SKA, SKO, and HH show the highest figures—195–250 kg—in contrast with the lower levels—130–170 kg—in the other villages. The former three villages have a rice surplus at the village level. Notable here is the large gap in rice consumption among different ethnic groups in KN and HS. However, the cases of HH and SKO are the opposite, probably because there was still plenty of land available to be reclaimed for lowland paddy cultivation when the non-Lao people immigrated into the villages. 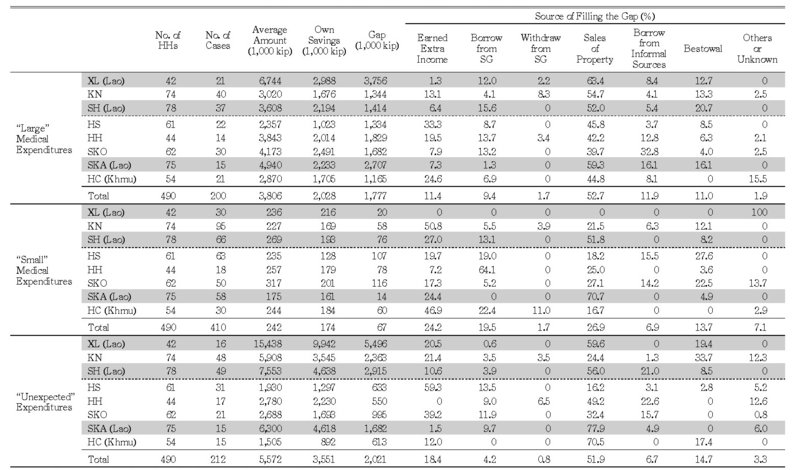 Table 6 shows household income and its sources. Income from subsistence rice (produced and consumed by the same household) is added by imputing it with the prevailing rice price in the market. The major findings are as follows. First, a large disparity is observed in per capita household income among the villages. XL experiences an extraordinarily high income, mainly because of its handweaving industry and small trade businesses.17) The two villages of SH and KN follow.18) In SH some villagers operate guesthouses or restaurants for tourists, which is a major factor in the village’s high income. Pineapple production is the major income source in KN. Besides, salary and wages are important in the three villages due to their proximity to urban centers. Note: 1) The conversion rate from paddy to rice was assumed to be 0.6. 2) Rice traders/shopkeepers/restaurant owners (N=17) were excluded from the estimates. 3) The number of household members is much larger than in Table 1, because some respondents included family members who should not be included as household members (according to our definition), so in Table 1 adjustment was done. However, all the family members the respondents mentioned to us should be included when estimating per capita rice consumption. Note: Income from subsistence rice was calculated on the assumption of 2,500 kip/kg (paddy), from which cost (assuming 20% of gross income) was deducted. Seed for the next year and paddy sold were deducted from the gross produce. Second, per capita income of the remaining five villages ranges from 1.2 million to 1.8 million kip, except for HC, which records only 815,000 kip. Note that the important income sources of these villages (except HC) are agriculture (both rice and non-rice) and livestock. HC is an exception, depending more on sales of non-timber forest products such as chandai (wood of aloe), khem (tiger grass), and mak neng (cardamom). The HC villagers seem to be further impoverished after the LA program, because they failed to introduce new cash crops. The Khmu in HS also suffer an extremely low income. Education is important when people try to get remunerative non-farm income. 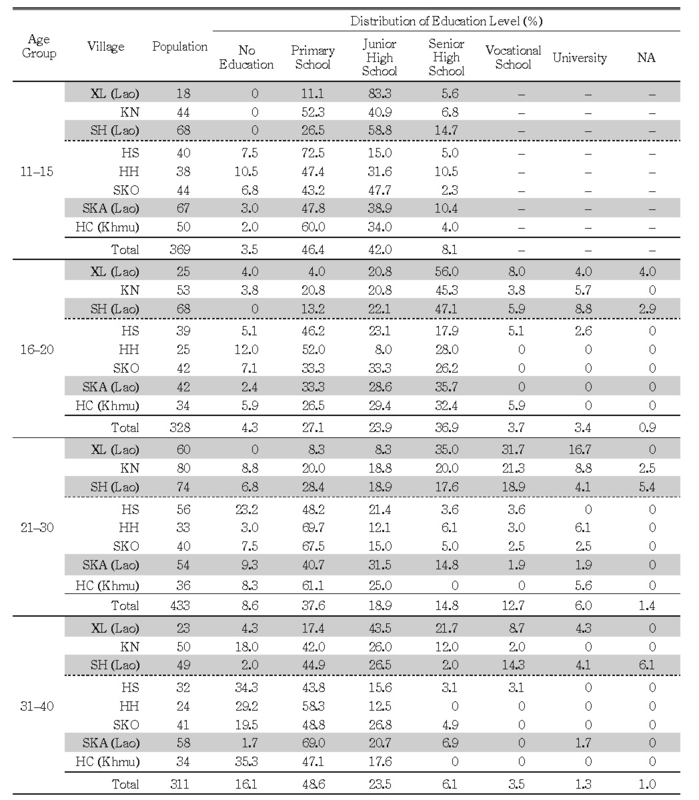 Table 7-1 illustrates educational status according to age group. First, most people aged 31–40 (born during 1970–80) did not go to junior high school—an average of 65% (especially high at 88% in HH, 82% in HC, 78% in HS, and 71% in SKA). On the other hand, more people studied up to senior high school/vocational school/university in XL (35%), SH (20%), and KN (14%). Second, more people aged 21–30 (born during 1980–90) attained higher education. The share of people who did not go to junior high school decreased to 46% on average. However, the share was still quite high in SKO (75%), HH (73%), HS (71%), and HC (69%). Third, young people aged up to 20 (born after 1990) were more educated in general, although many people aged 16–20 decided not to go to junior high school, especially in HH (64%), HS (51%), and SKO (40%). Notable here is the low figure in HC (32%). HC villagers seem to have started investing more in education, but the problem is that all the villages along the Ou River have only primary schools. Parents need to send children to Nong Khiaw or Muang Ngoy for junior high school, which requires large expenditure. 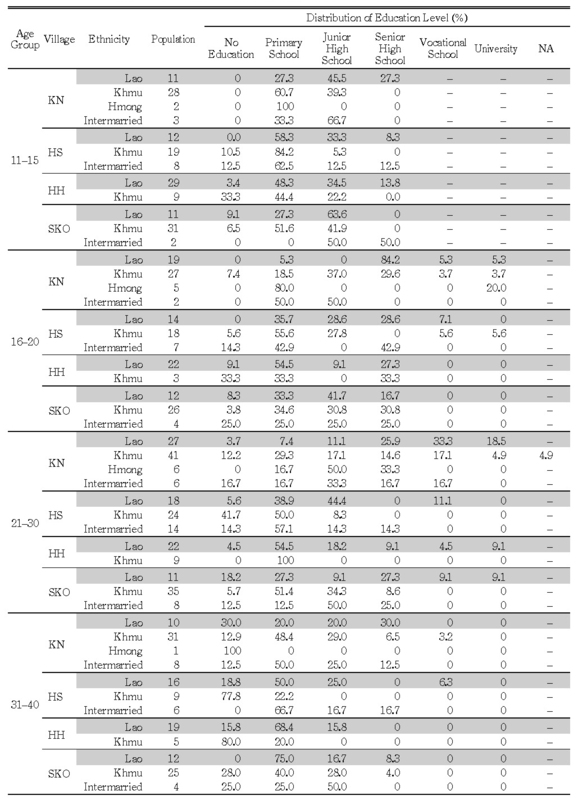 Fourth, in all the generations a large gap can be observed among different ethnic groups in the multiethnic villages of KN, HS, HH, and SKO (Table 7-2). The Khmu and Hmong in general lag behind in child education; this has serious implications for young people in obtaining remunerative non-farm jobs in the future. 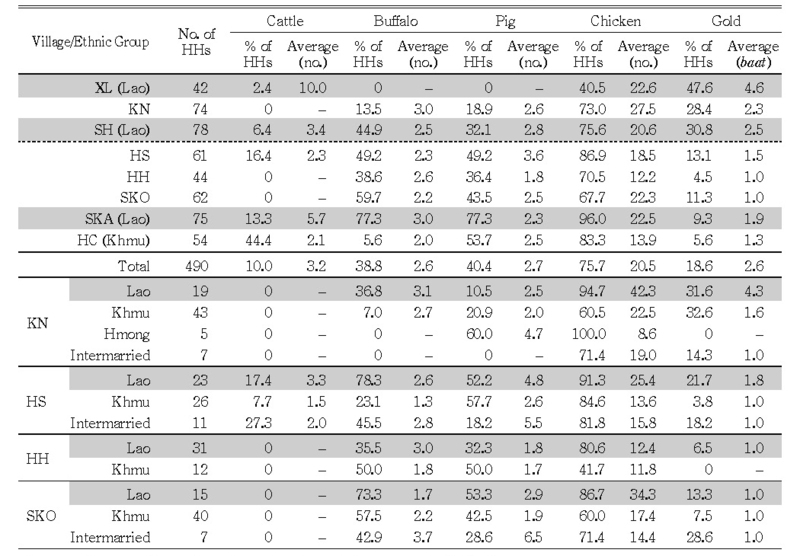 Table 8 shows the holding status of livestock and gold, the two major in-kind forms of savings in rural Laos. On average, 10% of households have 3.2 heads of cattle, 38.8% of households have 2.6 buffaloes, 40.4% of households have 2.7 pigs, 75.7% of households have 20.5 chickens, and 18.6% of households have 2.6 baat (1 baat=15.2 grams) of gold. The international price of gold during 2010–11 was around US$40–50 ( 400,000–500,000kip) per gram and therefore 6 million–8 million kip per baat. One baat of gold is more valued than a buffalo. Disparity among villages and households, however, is quite large. Note: Averages are only for owning households. Table 9 is a summary of house type and diffusion of major consumer durables. It more or less corresponds to the per capita income level of each village shown in Table 6. The savings groups (SGs) originating in Northeast Thailand were introduced to the study areas after the early years of the twenty-first century. According to a staff member of the Lao Women’s Union (LWU) in Ngoy District, as of the end of October 2010, 35 of the 85 villages in the district (41.2%) had already organized SGs. The establishment of SGs in the district was started in 2006 with 3 groups, followed by 29 groups during 2007–08 (supported by the NGO World Vision) and 3 groups in 2009. SGs are organized at the village ( ban) level, and a few women are selected for training in accounting, bookkeeping, etc. The basic system is to collect monthly savings (usually a minimum of 5,000 kip per member),19) which is lent back to members who request a loan. Loans are extended for several months at 3–4% monthly interest, though the amount of loans cannot exceed five times the savings of the borrowers. Besides, in some “emergency” cases, SG members are entitled to interest-free loans for the first month and loans at 3% per month for the succeeding months.20) Any villagers, including males, can be members, but usually only women can borrow. Normally once a year 70% of profit is distributed to members as dividend according to their savings amount. A part of the remaining 30% of profit is set aside for a common fund, such as an “emergency fund,” “welfare fund,” etc. SGs are monitored by the LWU and have a more “formal” nature at the village level, so they are a bit different from traditional VRFs such as rice banks and livestock banks. Table 10 shows an overview of SGs in the study villages. Note that in KN the first SG to be established was dissolved due to internal conflicts, and a new one was started after a while. Because of this, many members quit the group. In SKA, an SG was established in 2007 but due to the financial crisis arising from an excess demand for borrowing for “emergencies,” it was closed in February 2009; it was reopened in April 2009. On average, the rate of participation of households is 57.8%. It varies from 37.8% (KN) to 78.6% (XL), indicating no relationship with the degree of economic development in each village. In advanced villages (XL, KN, and SH), however, a clear tendency is observed: often more than one member from each household joins. This indicates that people in advanced villages try to utilize SGs as an opportunity to save rather than using it as a source of credit. In contrast, people in backward villages view SGs more as a source of credit. 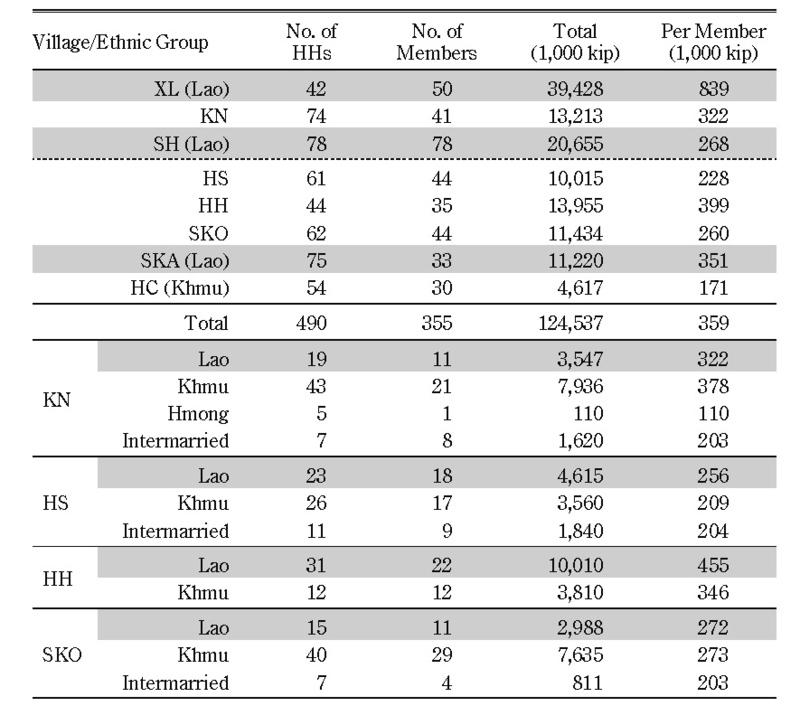 With regard to the influence of ethnicity in the multiethnic villages, some villages (KN and HS) show less active participation of non-Lao people, but in other villages (HH and SKO) such a tendency is not observed. We can tentatively hypothesize that due to certain barriers non-Lao ethnic people tend to be alienated from SGs. This issue will be investigated later. Considering the extreme importance of medical expenditure in utilizing loans from SGs, let us now examine how villagers face health risks and other emergencies and how they cope with such difficulties, before discussing the role and limitations of SGs. Table 13 is a summary of the medical expenditure incurred by households. Medical expenditure is divided into two: “large” if exceeding one million kip (approximately US$100) per annum and “small” if less than one million kip. The table shows that, on average, the number of cases of “large” and “small” expenditure in a year reached 0.41 and 0.84 per household respectively. The average amount of expenditure per case is 3.81 million kip for “large” and 242,000 kip for “small” medical expenditures. And the total medical expenditure per annum is quite large: on average 860 million kip, which is 7–28% of total cash income. Table 15 shows how villagers cope with the needs of both medical and unexpected expenditures. On average, in the case of large medical expenditure, after 53% of the total expenditure is covered by villagers’ own savings the gap is filled by property sales (53%), borrowing from informal sources (12%), earning extra income (11%), bestowal (11%), and borrowing from an SG (9%). In the case of small medical expenditure, after 70% of the total expenditure is covered by villagers’ own savings the gap is filled by property sales (27%), earning extra income (24%), borrowing from an SG (20%), and bestowal (14%). Lastly, in the case of unexpected expenditure, after 64% of the total expenditure is covered by villagers’ own savings the gap is filled by property sales (52%), earning extra income (18%), bestowal (15%), borrowing from informal sources (7%), and borrowing from an SG (4%). The property most often sold in an emergency is livestock, including cattle, buffalo, pig, chicken, etc. Other properties that are sold include gold, teakwood, stored crops, and so on. In sum, our analysis clearly indicates the limitations of SGs. Although the major purpose of borrowing from an SG is to meet medical expenditure, only a very small fraction of such expenditure (5.2% and 5.9% for large and small medical expenditure, respectively) is actually met by borrowing or withdrawal from an SG. There is a possibility that the role of SGs in meeting medical expenditure will be enhanced in the future if savings increase, but in fact the SGs in most of our study villages are not experiencing a smooth accumulation of savings. One of the major problems with SGs is apparently the small amount of loans they can provide, especially compared to the cash needs in emergencies (Table 16). Note: “Large” expenditures entail more than one million kip a year and “small” entail less than one million kip. SGs can meet the cash needs of small-scale emergencies such as a “small” medical treatment, but as Table 15 demonstrates, when such small-scale emergencies do occur people do not actually rely heavily on borrowing from SGs, probably because the latter have far smaller funds relative to people’s needs. Note: Medical expenditures are for the last year, whereas “unexpected” expenditures are also for one year but were incurred during the last two years. The villagers can only borrow from SGs more or less the same amount of their cash in hand. In Ngoy District, World Vision operated rice banks in 28 villages as of March 2010 (interview at the World Vision Ngoy District Office on March 16, 2010). Among the study villages we find such rice banks in SH, HS, and HC. Rice banks started in 2006 in SH and 2008 in HS and HC, with an initial provision of 2.5–3 tons of rice from World Vision. Village managers are appointed, rice is loaned in July–September, and borrowers repay the loan the following January with 15–20% interest (making the annual interest rate well above 30%). The average amount of rice borrowed per household is around 100 kg (with a value of roughly 400,000 kip). Rice banks play a similar role to SGs, although their aim is to provide rice for home consumption. “Borrowing from informal sources” and “bestowal” play an important role if people have a strong social network.26) The problem here is also the limited amount of money for borrowing if people rely on relatives and friends alone. There are several professional moneylenders in Nong Khiaw town, but since they charge 15–20% monthly interest many people do not dare to borrow from them. As already mentioned, the last resort when people need a large amount of money is “property sales,” including gold, livestock, and even some consumer durables (such as motorbikes). On the other hand, Table 15 also shows that SGs play an important role, especially when people need small medical expenditures. After meeting a certain portion of the necessary expenditure from their own savings, as mentioned above, they borrow 9%, 19%, and 4% of the balance for large, small, and unexpected expenditures from SGs. At least for meeting small medical expenditures, SGs play an important role. How can we facilitate greater participation in SGs, with household participation rates being limited to 57.8% on average—ranging from 37.8% (KN) to 78.6% (XL)? To address this question we propose a binary probit model to estimate a household’s decision on whether or not to participate in an SG. A dependent variable is SG membership, which is 1 if the respondent household has an SG member and 0 otherwise. Village-wise results are shown in Table 17. Data show that some variables turn out to be 0 for both members and non-members. They are indicated as “NA” in Table 17. Sometimes a variable has a positive value for members but 0 for non-members. Statistically such variables cannot be included in a probit model, because they turn out to be identical with the dependent variable. However, such variables are vital for decision making on whether or not to participate in an SG. These cases are indicated as “Z” in the table. Note that the independent variables “age” and “education” are for household heads (“education” is categorized as no schooling, primary school, junior high school, senior high school, vocational school, and university). The “civil servant” and “trader” dummies are 1 if there are (at least one) civil servants and/or traders among household members, and 0 otherwise. The “shock” dummy depends on whether the household had unexpected expenditure during the last two years prior to our survey. The non-Lao dummy is 1 in the case of non-Lao households and 0 otherwise (including multiethnic households). The average figures for the independent variables are shown in Appendix 1. The major findings are as follows. First, the parameters of the size of labor force are positive and significant for five villages among our eight target villages. This can be interpreted to mean that the higher the number of the labor force the more stable (at higher levels) the household income. A constant flow of income is assumed to induce households to participate in SGs, since it enables households to save every month with ease. Second, at least one of the livestock parameters, especially that of small livestock such as pigs and chickens, is positive and significant except for KN. This can be interpreted to mean that more frequent opportunities to get cash income (from livestock activities) enable households to save on a regular basis and hence induce them to participate in SGs. 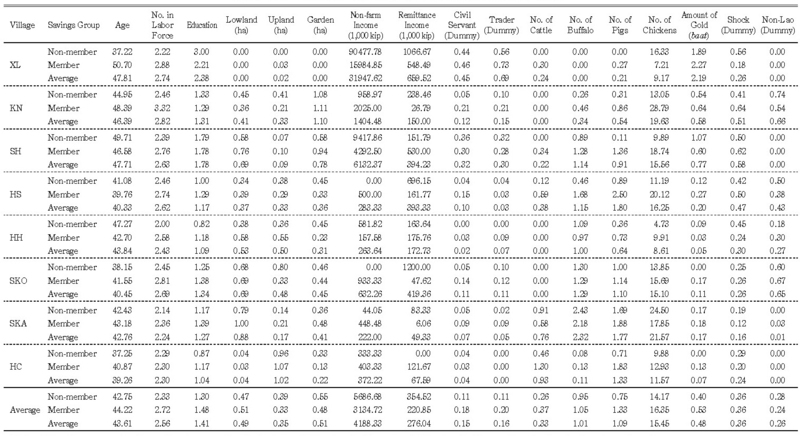 Considering that the loan purpose from SGs associated with livestock is negligible (Table 12), obtaining loans for livestock working capital is not a strong motive for SG participation. Third, the parameters of remittance are negative and significant for KN and SH. It can be assumed that remittance offers a safety net against emergencies and hence reduces the necessity for SG participation. Some types of non-farm income may play a role similar to remittances. Notes: 1) Pseudo R2 is Cox-Snell. 2) MC for HC implies that buffalo are excluded to evade the multicollinearity problem because only lowland owning farmers own buffalo. 3) Village dummies are included for the aggregate function, but not displayed. 4) * p<10%, ** p<5%, *** p<1%. Fourth, the parameters of gold are negative and significant in some villages (XL and HH). This can be interpreted to mean that savings in the form of gold functions as a substitute for savings in SGs. In this connection, the positive sign of the parameters of livestock mentioned above implies that savings in the form of livestock do not function as a substitute for savings in SGs, contrary to the case of gold. Fifth, the parameters of the non-Lao dummy are generally not significant, and in SKO they are even positive and highly significant. The hypothesis that the non-Lao households in multiethnic villages are alienated from SGs is rejected, even in KN and HS. Lastly, note that when we add an indicator for new (less than 15 years) immigration to villages as an explanatory variable, the variable does not show significance (not shown in Table 17). The hypothesis that new immigrants are alienated from SGs is also rejected. The savings group (SG) movement was transplanted from Northeast Thailand to Laos in the mid-1990s, starting from villages in Vientiane Municipality, one of the most advanced rural areas in the country, with a relatively favorable infrastructure. After several years the system was introduced to remote rural areas with a poor infrastructure. Since the middle of the first decade of the twenty-first century it has existed in Luang Prabang Province, including the remotest mountainous villages. From the mid-1990s or a decade later, on the other hand, mountainous rural villages in northern Laos experienced a drastic transformation due to the government’s policy initiative for shifting cultivation stabilization. Shifting cultivation based on a communal land management system became restricted, and with the introduction of a land allocation program rural households were allocated three to five plots of upland. Their customary land use rights were thus negated, and people were prohibited from using other lands for cultivation. They were encouraged to convert the allocated plots to permanent upland fields for growing cash crops. The government also encouraged them to reclaim lowland paddy fields. Such a policy hit rural people, particularly those of non-Lao ethnicity, because, unlike the Lao, they had traditionally depended on shifting cultivation and were unfamiliar with cash crop production and lowland paddy cultivation. As a result, migration of non-Lao ethnic people accelerated from highland to lowland areas and from upstream to downstream areas. Some people even migrated to urban areas such as Luang Prabang and Vientiane. Others migrated mainly to Lao-dominated villages. In this paper, based on data for 490 households collected in 2010–11 from eight villages in Luang Prabang Province, we first analyze how people responded to the shifting cultivation stabilization policy by showing detailed data on their economy and livelihood. Then, we focus on the performance of SGs. Together with the data on how people cope with health and other risks we discuss the role and limitations of SGs. To conclude the paper we will summarize the major points, particularly in relation to the performance of SGs in the study villages. The eight study villages are broadly classified into two categories: advanced villages (XL, KN, and SH) and backward villages (HS, HH, SKO, SKA, and HC). In general, there is a sharp contrast between the two groups in almost all aspects, including per capita income, rice consumption, occupational diversification, education, house structure, dissemination of consumer durables, and non-land assets such as livestock and gold. It is found that the SGs in the study villages, after their establishment in 2006–07, have not experienced smooth growth (measured by accumulated savings), especially in backward villages. The sluggish growth of savings resulted in a shortage of funds to be credited to needy members. The amount of borrowing from SGs is slightly less than 600,000 kip on average, with the most frequent amount being 500,000 kip (23%), followed by 300,000 kip (16%), 200,000 kip (16%), 1 million kip (14%), 100,000 kip (7%), and 600,000 kip (5%). Considering that the regular cash in hand among rural households is slightly less than 300,000 kip whereas the usual borrowing from rice banks (operated by World Vision) is 100 kg of rice, which is roughly equivalent to 400,000 kip, it can be said that the amount of borrowing from SGs is basically small. Since the major reasons for borrowing from SGs are “medical treatment” and “consumption,” SGs function as micro-insurance providers rather than credit providers for production purposes. However, the demand for credit for such purposes, especially for medical treatment, is quite large, far exceeding the funds that SGs accumulate. For instance, on average, 410 cases (for 490 households) spent 242,000 kip per year for small (with annual expenditure of less than 1 million kip) medical treatment and 200 cases spent 3.8 million kip for large medical treatment. In addition, 212 cases had to spend 5.6 million kip for other emergencies. A large part of such necessary expenditures is met by villagers’ own savings and sales of property. However, at the same time, it is found that after meeting a certain portion (53%, 70%, and 64% for large and small medical expenditures and unexpected expenditure, respectively) of the expenditure from their own savings, villagers cover 9%, 19%, and 4% respectively of the rest by borrowing from SGs. At least when it comes to small medical expenditures SGs do play an important role in funding. (5) The hypothesis that non-Lao ethnic households in the multiethnic villages are alienated from SGs is rejected. The probit analysis indicates that in order to facilitate rural people joining SGs, the most important thing is to stabilize their income (at higher levels), in other words to enable them to get cash income constantly (smooth the income-earning structure). The other important factor for facilitating people joining SGs might be an injection of seed money from outside. In the case of rice banks, for instance, NGOs initially provide a certain amount of rice stock for starting the banks. In the case of SGs in Luang Prabang Province usually only a small amount of money is provided in the beginning. Generally speaking, SGs are much more cost-saving compared to Grameen Bank-type microfinance schemes, so the injection of more seed money can be justified if the money is used efficiently and with transparency. Finally, the paper identifies several policy agendas for stabilizing or enhancing rural livelihoods, especially for the non-Lao ethnic minority. First, the development of infrastructure, especially rural roads (connecting to main roads), is vital for facilitating cash crop production in allocated upland fields. Second, programs for improving public health are vital for reducing the heavy financial burden on rural people. Third, given the critical importance of higher education for the long-term development of rural economies, serious consideration should be given to a strategy for financially supporting education expenditures. Fourth, in villages that still have abundant room for reclaiming lowland fields, financial support for accelerating a land reclamation process needs to be considered. We would like to thank Prof. Fumikazu Ubukata (Okayama University), Dr. Yutaka Arimoto (Institute of Developing Economies), Prof. Saythala Saybouheuang, and Prof. Thavisay Phimphisane (Soupanovoung University, Luang Prabang, Laos) and his Lao students for data collection. Khamphay Manivong; and Phouthone Sophathilath. 2009. Land Use Planning and Land Allocation in the Upland of Northern Laos: Process Evaluation and Impacts. Singapore: The Economy and Environment Program for Southeast Asia. NERI (National Economic Research Institute). 2003. Rural & Microfinance Statistics in Laos. NERI; and Concern Worldwide Lao PDR. 2005. A Study of the Expenditure Patterns & Saving Habits of Ethnic Minority Groups in Lao PDR. Rigg, Jonathan. 2005. Living with Transition in Laos: Market Integration in Southeast Asia. London: Routledge. Takahashi, Shimako; and Liang, Luohui. 2010. Implications of Policy Interventions for Land Use Changes and Local Livelihood in Lao PDR. Policy Matters 17: 51–54. UNDP (United Nations Development Programme); and UNCDF (United Nations Capital Development Fund). 1997. Microfinance in Rural Lao PDR. World Food Programme (Vulnerability Analysis and Mapping Branch). 2006. Lao PDR: Comprehensive Food Security & Vulnerability Analysis. Yokoyama, Satoshi. 2003. A Geographical Study on the Basis for Existence of Mountainous Villages in Northern Laos. Unpublished PhD dissertation, University of Tsukuba. Note: Education: no schooling=0, primary school=1, junior high school=2, senior high school=3, vocational school=4, university=5. 1) There is evidence, however, that the rural economy in Laos was much more commercialized long before. See, for instance, Rigg (2005, 47–50) in general and Yokoyama (2003) in the upstream area of the Ou River (upstream of our research area). 2) Whether the practice of shifting cultivation really damages natural resources or not, however, is a controversial issue. Rigg (2005) believes there is not enough rationale for a shifting cultivation stabilization policy, saying that “a context is created from which certain development interventions are justified and given legitimacy” ( ibid. , 26). 3) The agreement contained details on the formal authorization of use rights to the concerned families over allocated parcels, with a prohibition on the sale of land and the amount of fines to be paid by users if agreements were not followed. The agreement was signed by the concerned landholder, village head, and District Agriculture and Forestry Office. See Khamphay and Phouthone (2009). 4) The TLUC specified the period of validity for three to five years and was planned to be replaced by the Permanent Land Use Certificate, but this procedure was actually not followed (Khamphay and Phouthone 2009). 5) For a critique of the shifting cultivation stabilization policy and resettlement policy in Laos, see Rigg (2005). 6) Muang Ngoy town was the center of Ngoy District before the construction of NH1. After the road construction, Nong Khiaw town developed rapidly and replaced Muang Ngoy as the center. Sop Houn (SH) is located at the opposite side of Nong Khiaw town, beyond the Ou River. 7) The road construction started in 2006. SKA is located at the end of the road, and there are four villages in between before reaching NH1. The total length of the road is approximately 17 km. The responsibility of road construction was allocated to the five villages, and SKA was responsible for 5.3 km up to the adjacent village. The NGO World Vision provided 12 tons of rice to SKA village for the road construction and the improvement of irrigation facilities. Three wooden irrigation weirs were substituted by concrete weirs in 2008, and the road was completed in 2010. The villagers basically provided free labor, but they were given rice as wages when they worked hard and intensively. 8) According to several village informants, after the road construction traders often came to the village to sell daily necessities and purchase agricultural products. 9) In KN we selected 74 households (39.6%) based on random sampling, because the village size was too large (187 households). In the case of XL, 42 samples were selected from 67 households (62.7%) as the major purpose of the survey in the village was to provide training to the survey enumerators (university students). 10) However, we failed to cover a few households due to various reasons. 11) According to the 1995 National Census, the population of Luang Prabang Province comprised Khmu (45.9%), Lao (28.6%), Hmong (15.2%), and others (Yokoyama 2003, 7). 12) The exception was HC, where only two plots were allocated due to the limited availability of land. 13) We noticed a tendency for respondents to try to hide from us the fact that they were still practicing (or even used to practice) shifting cultivation, as they were afraid of the government. 14) Usually, villagers reclaimed lowland fields by manual labor (including hired labor) step by step for a fairly long period of time. 15) HH still has substantial room for reclaiming lowland fields, as the villagers just migrated from the opposite side of the Ou River in 2000. By contrast, there is no such room remaining in SKO and only a little in SKA. 16) KN is widely known as a “pineapple village.” Pineapple was introduced to the village before 1977. In 2010 a rotational land use system was practiced as follows: in March farmers slashed and burned bushes and grasses in the field; in June they sowed upland rice seeds; during July–September they carried out monthly weeding before the harvest in October. In the meantime, pineapple was planted in the same field in July. Harvesting of pineapple starts only after two years. During the two-year period, weeding is repeatedly performed in the field. Pineapples are harvested during June–September, usually for three successive years. After that, the field is left fallow for two to three years before the same cropping cycle starts again or the field is converted to teak plantation. 17) Since the villagers were forced to move to the bank of the Mekong River without lowland fields, they tried to overcome the difficulty by starting a handweaving industry. Small trade businesses were developed after many tourists came into the village to see and buy handwoven products. 18) The per capita income of KN is relatively low, close to the level of SKO and SKA, but in terms of cash income KN records a much higher amount. 19) There is usually no upper limit. 20) Some SGs have a regulation that interest-free loans are extended for more than one month until borrowers escape from their “emergency” situation. 21) The same tendency is observed in KN, but there might be an influence of the internal conflicts among SG members mentioned above. 22) We found an informal rotational savings and credit association ( houei) in SH for the purpose of providing credit for production needs. Some of the villagers, especially those engaged in businesses for tourists, participate in the houei. They collect 300,000 kip per month, so the size of the houei is quite large. UNDP/UNCDF (1997, 43) pointed out that houei are much more an urban than a rural phenomenon. The case in SH also has an urban nature, in the sense that it is related to businesses for tourists. The other source of credit for production purposes is the Agricultural Promotion Bank (APB), but it is found only in villages with favorable access to urban centers. Our survey of village informants, for instance, shows that 27 households in SH borrowed from APB, with an average loan size of 5 million kip, and 16 households in HS borrowed from APB, with an average amount of 2.5 million kip. The interest rate is 1.2% per month. 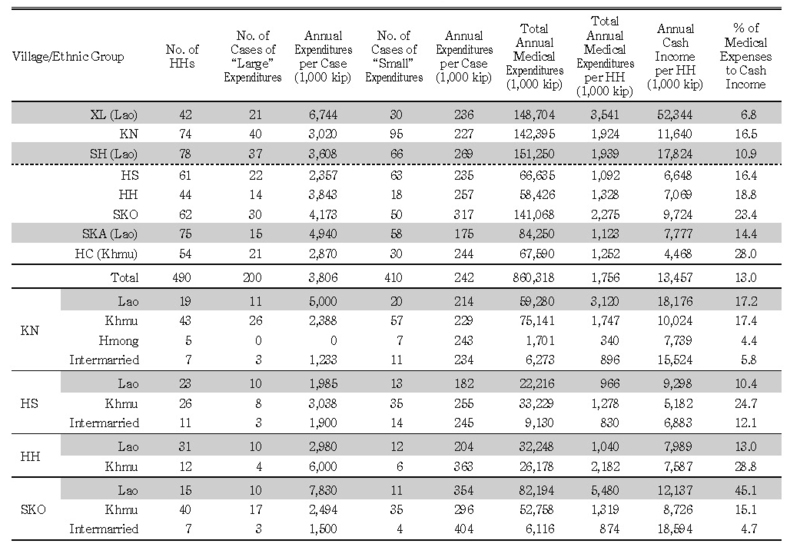 23) As shown in the table, however, some cases occurred more than two years ago. 24) Although we asked about “unexpected” expenditure, cases are included that can be easily expected by villagers, such as house construction and education. Such occasions have been included since a relatively large expenditure is needed and people usually cannot fully prepare for such incidents. 25) In KN we observed more cash in hand in July and August, mainly because residents had to pay school fees. 26) See the third article in this special issue by Ohno and Chansathith.